Go Ahead. Make My Day! Clint Eastwood. I think we should all have one of these hanging in our offices, homes, schools and gyms! This white background sign measures 5.5x24 and comes with the grass rope hanger for easy hanging. Handcrafted with pride! 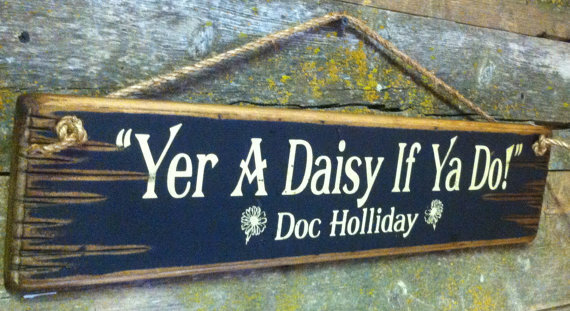 Yer A Daisy If Ya Do! "- Doc Holliday. This quote from the movie Tombstone is still said today. This black sign measures 5.5x24 and come with the grass rope hanger for easy hanging. Handcrafted with pride!! There's No Normal Life. It's Just Life. Get On With It. Doc Holliday. This burnt orange background sign measures 5.5x24 and comes with the grass rope hanger for easy hanging. Handcrafted with pride! I Stand Corrected, Wyatt. You're An Oak! Doc Holliday, Tombstone Movie Quote. Best. Movie. Ever! This is spoken to Wyatt when he refused to dance with Josephine... Which we later find out they fall in love... This rust background sign measures 5.5x24 and comes with the grass rope hanger for easy hanging. Handcrafted with pride! You're No Daisy. You're No Daisy At All! The famous fight between Doc Holliday and Johnny Ringo in the movie Tombstone ends with Doc saying this quote. This natural background sign measures 5.5x24 and comes with the grass rope hanger for easy hanging. Two real metal stars are placed on either side of Doc Holliday's name. Handcrafted with pride! "I Won't Tolerate Rude Behavior!" 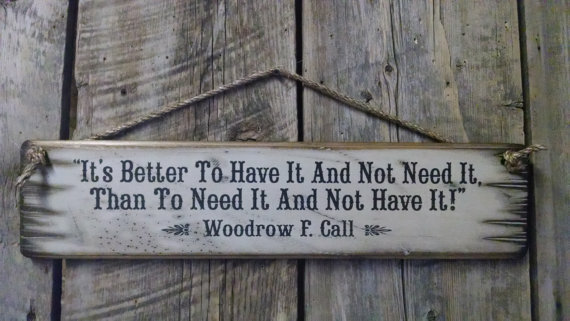 - Woodrow F. Call. One of the most famous lines from the movie Lonsesome Dove. This sign measures 5.5x24, has a black background and comes with the grass rope hanger for easy hanging. Handcrafted with pride! Dyin' Ain't Much of A Livin', Boy, The Outlaw Josey Wales. Add this to your western decor… because it's the truth This navy background sign measures 5.5x24 and comes with the grass rope hanger for easy hanging. Handcrafted with pride! Go Ahead... Skin It! Skin That Smoke Wagon & See What Happens! Wyatt Earp, Tombstone Movie Quote. Good Movie. Good Actor. Good Quote! This rusty red sign measures 5.5x24 and comes with the grass rope hanger for easy hanging. Handcrafted with pride! 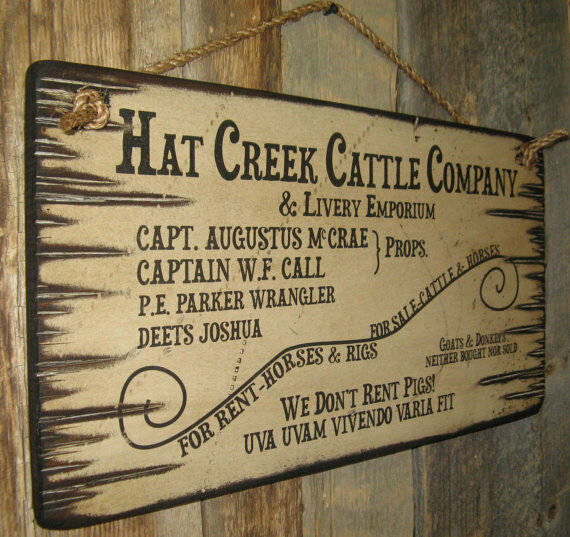 A smaller version of the "Hat Creek Cattle Company" sign from the movie Lonesome Dove. BEST SELLER!!! This sign measures 11x21, has a white background, and comes with the grass rope hanger for easy hanging! Gus, Call, Pea Eye and Deets are proudly posted on the sign. Handcrafted with pride! WE DON'T RENT PIGS!! 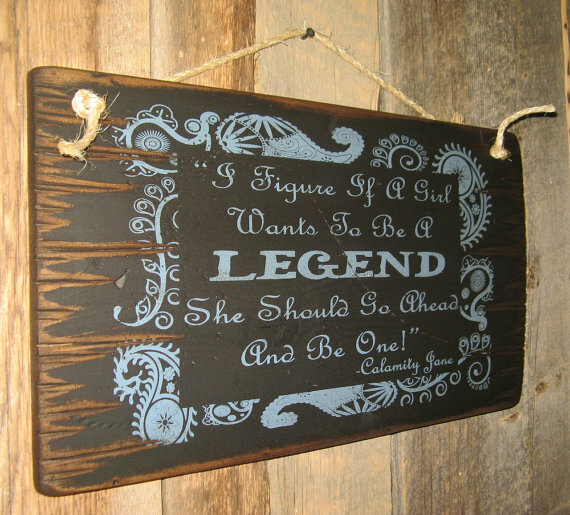 Taken right off of the famous "Hat Creek Cattle & Livery Emporium Sign"... This sign cracks me up! This white background sign measures 5x21 and comes with the grass rope hanger for easy hanging. Handcrafted with pride! Uva Uvam Vivendo Varia Fit! 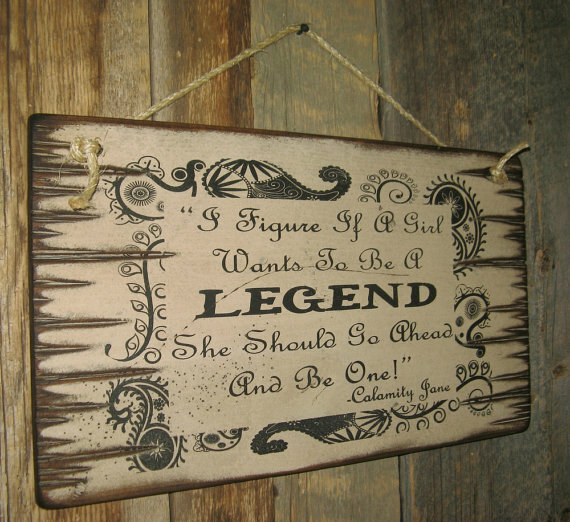 This sign is part of the original "Hat Creek Cattle Company" sign from the movie Lonesome Dove. This funny little sign is translated from latin meaning "a grape changes color when it sees another grape." This grey background sign measures 5.5x24 and comes with the grass rope hanger for easy hanging! Handcrafted with pride! I'm Sure Partial To The Evening. The Evening and The Morning. If We Just Didn't Have To Have The Rest Of The Dern Day, I'd Be A Lot Happier, Augustus McCrae. Another philosophical line from ole Gus… And I have to say I'd agree. This line was spoken by Gun in the book Lonesome Dove by Larry McMurtry. This tan background sign measures 5.5x24 and comes with the grass rope hanger for easy hanging. Handcrafted with pride! This rust background sign measures 5.5x24 and comes with the grass rope hanger or easy hanging. Handcrafted with pride! Young Fella, If You're Looking For Trouble, I'll Accommodate You. Otherwise, Leave It Alone!... Rooster Coburn. This is a quote stated when Coburn and La Boeuf were having a heated discussion in the movie True Grit. This black background sign measures 5.5x24 and comes with the grass rope hanger for easy hanging. Handcrafted with pride! Little Style Never Hurt Anyone, Woodrow! Augustus McCrae. Gus sure had all of the answers didn't he?? This grey background sign measures 5.5x24 and comes with the grass rope hanger for easy hanging. Handcrafted with pride! "I'm Gettin' Tired of All Yer Gas, Now Jerk That Pistol & Go To Work!" Wyatt Earp. Don't mess with Mr. Earp, he means business! One of the most famous lines in the movie Tombstone. This rust background sign measures 5.5x24 and comes with a grass rope hanger for easy hanging. Handcrafted with pride! !